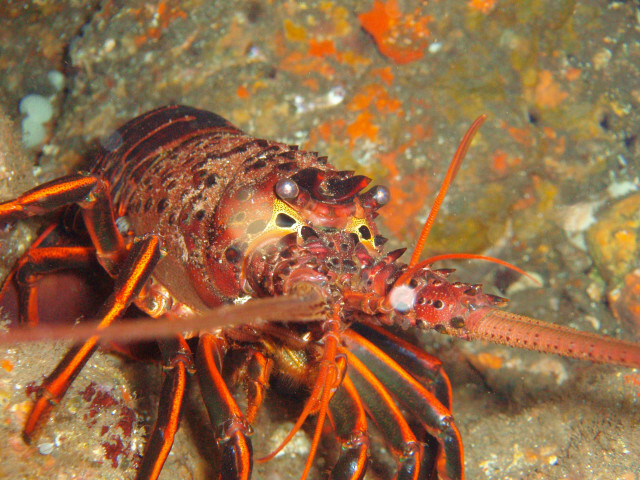 Catch a California Spiny Lobster during the annual Lobster Season in San Diego. Photo courtesy of NOAA. Lobster season opens on the Saturday prior to the first Wednesday in October and closes on the first Wednesday after March 15th, and is designed to protect the lobster population from overfishing during their summer reproductive cycle. The California Spiny Lobster can live 50 years and grow up to 25 pounds. At a market value of 20 dollars a pound, even the typical two or three-pound specimen is a worthy catch. Unlike its East Coast counterpart, the Spiny Lobster doesn’t have claws, but it’s still a tricky business to catch one, especially when you consider that divers are only allowed to use their bare (gloved) hands. Nocturnal hunters, they hide deep in caves and crevices by day, so divers typically do their hunting at night as well, when the lobsters – or “bugs” – venture out into the open. And, on the eve of opening day, it’s traditional among San Diego divers to gather at favorite hunting grounds at midnight, when bug season officially begins. Dive clubs and shops hold organized events on opening weekend, with prizes awarded for the biggest catch. Night diving is a surreal experience, focusing all your attention on the small area illuminated by the beam of your underwater flashlight. It’s not hard to spot lobsters, sideling across the bottom, and you’re likely to feel others bumping into you unseen. They’re not fast on their feet, but they can buck like a bronco when captured and jet backwards in a quick flip of the tail. The trick is to freeze them like a deer in the headlights, then quickly grab them from behind and wrangle them into your game bag. Lucky divers return home for a late night lobster feast, while non-diving spectators can enjoy the bounty of fresh lobster offered by local markets and restaurants this time of year. It goes without saying that diving requires formal training, especially at night. Always go with a buddy, know your limits and dive safe. For more information check with California Fish and Wildlife or a local dive or fishing outfitter.